The In Between is a new musical by accomplished young musician Laura Tisdall, and it is quite simply an extraordinary composition. Writing music, lyrics and book, Tisdall has released a concept album of 7 songs from her show, extracts of which were recently performed at London’s West End Live 2012. Venturing into Philip Pullman territory , Tisdall’s In Between of the title, is the space between two parallel worlds, into which her protagonist Flick Wimple steps. Orphaned at 8, and guided to early adulthood by her well meaning sister Alice who is 11 years her senior, the story finds Flick at 19. The album opens with the song She’s My Sister, in which Flick as a young woman on the verge of adulthood, describes the typical frustrations that adolescents feel towards the parent/guardian figure in their life. The song echoes aspects of Miracle from Tim Minchin’s Matilda, not just because both shows inhabit fictitious worlds that spin on slightly different axes , but rather because both songs brilliantly define their story’s key character. Through a range of tempos and styles, Ms Tisdall’s lyrics are witty, and her musical composition is both clever and refreshing on the ear. For this song , the sisters’ roles are sung by Dianne Pilkington and Cassandra Compton, and these two talented vocalists set the excellent standard that is upheld throughout the album. In Never Expect, Sabrina Aloueche sings of Flick’s being an outsider, not a part of the cliques of life and when she sings the line “I’m not a golden girl” one is reminded of Elphaba’s inability to fit in, in Stephen Schwartz’s Wicked. Tisdall’s song is more upbeat than say, I’m Not That Girl, from Schwartz’s composition, and within that context serves to define Flick’s character in a positive, rather than introspective manner, with no hint of self-pity. Most musicals feature the human conditions of love and desire, often against challenging odds. The In Between introduces Flick to Guide Calicus, a young man who is a part of that space between the worlds, and with whom it is suggested, Flick establishes a relationship. On the concept CD, two of Calicus’ solo numbers are included, Out Of Your World, performed by Daniel Boys and Beyond the Door, sung by Hadley Fraser. Both of these songs have a resonance that could truly fill a large stage. Boys encourages the cautious Flick to consider venturing from her world whilst Fraser decribes in a soaring performance, the world that he wants Flick to make her own. 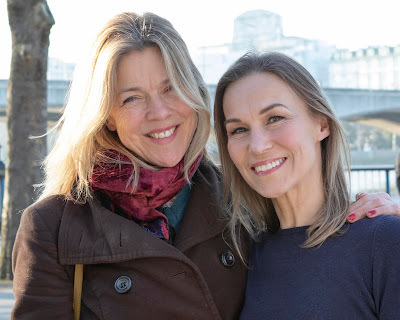 Alice’s character is given a further song on the CD, and Julie Atherton’s version of When I Was 19, is a poignant look back from an elder sibling, at the challenges her sister has faced. It is pleasing to hear Atherton away from a comic performance, and to be reminded just how versatile, perceptive and above all, moving her delivery can be. Flick’s biggest number on the concept recording is Someone You’ll Be Proud Of . A song that opens peacefully, addressed to her dead parents and then evolves into a wave of voice and music as Flick celebrates her growth into maturity. Lauren Samuels has been tasked with performing this number and she does not disappoint. Past the middle-eight, her singing is positively spine-tingling. Alexia Khadime and Liam Tamne perform Not Alone, and they deliver what is the CD’s only duet of Flick and Calicus, with impressive strength and harmony. This concept release is virtually faultless. Tisdall has crafted a modern musical that echoes contemporary themes of story telling yet weaves traditional journeys of love and self discovery, into 25 minutes of sheer listening pleasure. Based upon these 7 songs alone, the entire show should be outstanding. Buy this recording and support the work. The In Between deserves a staging soon and has the potential to become a major West End hit.